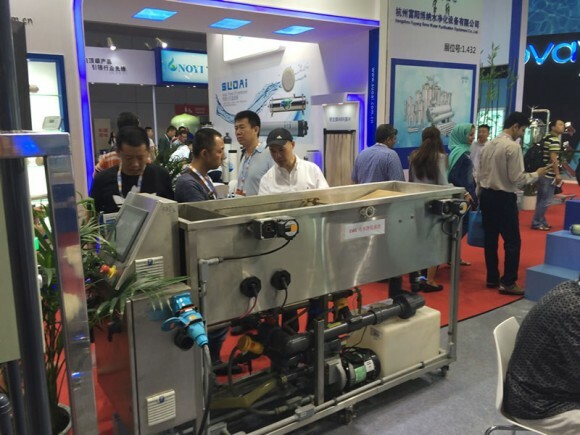 Los Angeles, CA and Shanghai, China – June 20, 2016 – OriginClear Inc. (OTC/QB: OCLN), a leading provider of water treatment solutions, today announced that it won the first-ever China Blue Tech Awards at Aquatech China, China’s largest and most important water industry expo. Judges named OriginClear and Milwaukee-based PaveDrain as overall winners from six finalists. OriginClear had already been selected as winner in the “Most Innovative Technology” category. Visitors to Shanghai’s Aqua Tech Innovation Pavilion observe a working demonstration of OriginClear’s EWS technology. This year’s judges comprised of a panel of five Chinese water treatment experts, including a professor from Tsing Hua University in Beijing and a top engineer from Siemens China. Winners were announced at the annual Awards Ceremony and Reception. Co-organized by Mandarin Environment and BlueTech™ Research, the China BlueTech™ Awards recognizes the most innovative water and wastewater technology companies that exhibit exciting potential in the Chinese and international markets. Representing European, Israeli, and North American water and wastewater technologies, the full list of entrants included both small and large companies with solutions across industry submarkets. OriginClear was selected for the innovation of its flagship Electro Water Separation™ with Advanced Oxidation (EWS:AOx) technology that cleans suspended organic matter, hydrocarbons as well as ammonia and other dissolved organic molecules that are often found in industrial wastewater streams. OriginClear’s EWS:AOx has field references at oil & gas operations in Colorado, Texas and California and has successfully demonstrated its ability to remediate landfill leachate in Shenyang, China.